Britain's Chris Froome is hoping to rescue his season with victory at the Vuelta a Espana, but faces a tough field in the year's final Grand Tour. Team Sky leader Froome, who crashed out of the defence of his Tour de France title in July, is one of six Grand Tour winners starting the three-week race in Spain on Saturday. Movistar's Nairo Quintana, 24, the 2014 Giro d'Italia winner, is favourite. "It is shaping up to be quite a race," 29-year-old Froome told BBC Sport. The 2013 Tour de France winner has a good record in the Vuelta, having finished second in 2011 - at the time the highest placing achieved by a Briton in a Grand Tour - and fourth in 2012. Froome said training had been going well after recovering from fracturing his left wrist and right hand in the Tour, adding: "I've done as much as I can in the time I had. "It has been a different approach to how I'd approach the Tour de France but I am here with less pressure and hoping to finish off the season in a good way. "I haven't had altitude training camps, or racing to test race fitness, so I'm coming in light and a big part will be to find that rhythm." He is buoyed by the strength of the nine-man Team Sky squad that will help him try to become the first British rider to win two of the three Grand Tour races. 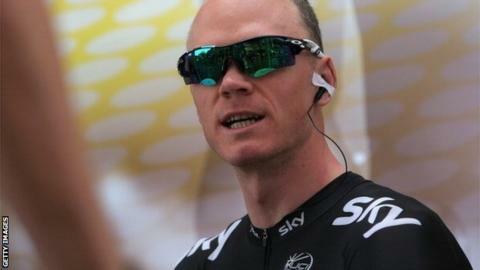 "We've got a really strong group of climbers in Pete Kennaugh, Mikel Nieve and Phil Deignan," said Froome. "They all showed strong form in climbs recently and that will be a huge support for me personally, while on the flat stages I'm going to be looked after by Luke Rowe and Christian Knees. We've got a really solid team here." Froome acknowledged Movistar would be "one of the strongest teams" but also expects Spanish duo Alberto Contador and Joaquim Rodriguez to be "up there". Contador, who has two Vuelta victories among his five Grand Tour triumphs, broke his shin when he crashed out of the Tour de France and was not expected to be fit for the 21-stage, 2,013-mile race. The Tinkoff Saxo rider, 31, is among the 198 starters but has played down his chances, saying: "I will have to plan very differently from what I had intended at the start of the season. Perhaps in the last week I will be able to fight for a stage victory." Colombia's Quintana, who did not ride in the Tour and should therefore be fresher, won the Vuelta a Burgos warm-up race, but was also coy on his chances. "I am in good form but there are other rivals who are also doing well at the moment," he said. Quintana is Movistar's joint-team leader with Spanish hope Alejandro Valverde, who won the race in 2009. Defending champion Chris Horner was withdrawn from the race on Friday, but fellow Grand Tour winners Ryder Hesjedal, of the Garmin-Sharp team, and BMC Racing's Cadel Evans are competing. Five British riders will start the race, with Froome, Kennaugh and Rowe in the Team Sky squad. Garmin-Sharp's David Millar, 37, will ride his final Grand Tour, while 22-year-old Orica GreenEdge racer Adam Yates embarks on his first. "I'm feeling quite relaxed," Millar, who is riding in his seventh Vuelta and 24th Grand Tour overall, told BBC Sport. "I'm excited because I love this race. "It's possibly my last race. I'm hoping that I'm going to feel good and winning a stage is definitely a goal." This year's route features 40 categorised climbs and 13 mountain stages, five flat stages, one team time trial and two individual time trials. The race starts with a 12.6km team time trial on Saturday in Jerez de la Frontera.